When it comes to district heating, Sweden has made the switch from fossil fuels to biomass and waste heat (see chart). As early as 2015, biomass provided 46 % of the energy in district heating networks across the country, followed by 24 % from waste incineration and 8 % from industrial excess heat. Fossil fuels came only to about 7 % of the around 175 petajoules, or PJ, produced in Sweden in 2015 (latest data available). These percentages, and the chart, were taken from a 2017 paper titled District heating and cooling in Sweden, written by Sven Werner, Professor Emeritus at Swedish Halmstad University. Sweden is one of the participating countries of Task 55 Towards the Integration of Large SHC Systems into DHC Networks of the IEA Solar Heating and Cooling programme. The researchers plan to publish a report with country portraits of selected solar district heating markets in 2019. All Swedish cities and most smaller urban areas have their own district heating (DH) network, with the current total standing at about 500. For example, in the county of Västra Götaland alone, there are more than 100 bioenergy DH systems, according to the EU project SDHp2m. In his paper, Werner writes that the first Swedish district heating system was introduced in the form of a combined heat and power plant in Karlstad in 1948. It was an oil-fired plant, used to complement the energy supply provided by hydroelectric systems after the war. The latest available data from 2014 shows that district heating met around 55 % of total demand. The proportion was 89 % regarding multi-family property and 80 % for service sector buildings, whereas it was only 17 % for single-family homes. Source: Werner, Sven. District heating and cooling in Sweden. Energy 126 (2017): 419-429. 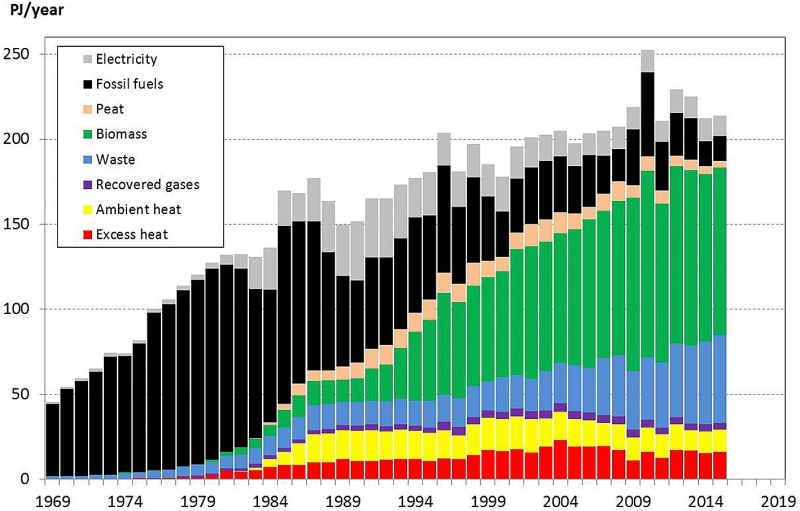 Sweden was the global leader in large solar district heating (SDH) installations from 1970 to 1995. The first-ever ground-mounted SDH system was a 2,000 m2 collector field operated by Östersund Energi in Torvalla between 1982 and 1992. The second was a 4,320 m2 collector plant run by Uppsala Energi in Lyckebo from 1983 to 2001 and the third a 7,500 m2 collector field operated by Telge Energi in Nykvarn between 1984 and 2008. Altogether, Sweden has seen the installation of 37 large-scale solar thermal systems. As many as 12 of them are no longer in operation. Today, there are 25 operational installations above 500 m2, according to the statistics by Jan-Olof Dalenbäck, Professor at Chalmers University of Technology, Sweden, at a total of 34,000 m2 or 24 MWth. Despite Sweden having been one of the first countries to develop large-scale solar plants, the market for the technology slowed over the last years because of a notable increase in the use of both biomass and waste heat. These sources of energy are rather cheap, as they are available locally in large amounts. In addition, the country has no specific support programmes in place, for neither DH nor solar thermal. Research conducted as part of the SDHp2m project has shown one key barrier to be the lack of experience which utility staff has in operating DH systems. The EU project prompted several feasibility studies across Västra Götaland County. Their aim was to evaluate the connection of small wood chip or briquette boilers of between 4 and 30 MW to SDH systems and additional heat storage. Dalenbäck presented the results of three of these studies during the 5th International Solar District Heating Conference in Graz, Austria, in early April. The heat costs of the solar collector fields measuring between 3,000 m2 and 5,000 m2 and the buffer tanks holding between 300 m3 and 500 m3 ranged from 450 to 500 SEK/MWh (43.5 to 48 EUR/MWh), which means that they were 30 to 50 % higher than the typical operating costs of plants using wood chips. Even the national carbon tax (link to http://www.solarthermalworld.org/content/swedens-solar-heat-market-hold), which is currently at around EUR 117 for every tonne of carbon dioxide, has no positive impact on Sweden’s solar heating market these days. The energy sources which compete with solar thermal for market shares are not fossil fuels but heat pumps and bioenergy.